This work is representative of Lee’s natural facility at capturing landscape, both in terms of composition and in the description of rapid cloud movement and effects of light and shade. His ability to present changing cloudscapes may have been responsible for the partiality of his first patron, William Wells, who considered that Lee’s work was superior to that of Constable. Kenneth Westwood notes that, ‘When viewing some of Constable’s sketches, [Wells’s] only comment was that they “might be of service to Lee”.’ Westwood also records Ruskin’s remark, that Lee ‘painted with constant reference to nature’. This may have been designed to silence contemporary criticism of his lack of finish and use of naturalistic colouring: because of the discolouration of Old Master landscapes, the ideal landscape of the late 18th-early 19th century was the tint, as Sir George Beaumont put it, ‘of an old Cremona violin’, and Lee was attacked – astonishingly – for making his landscapes too green. 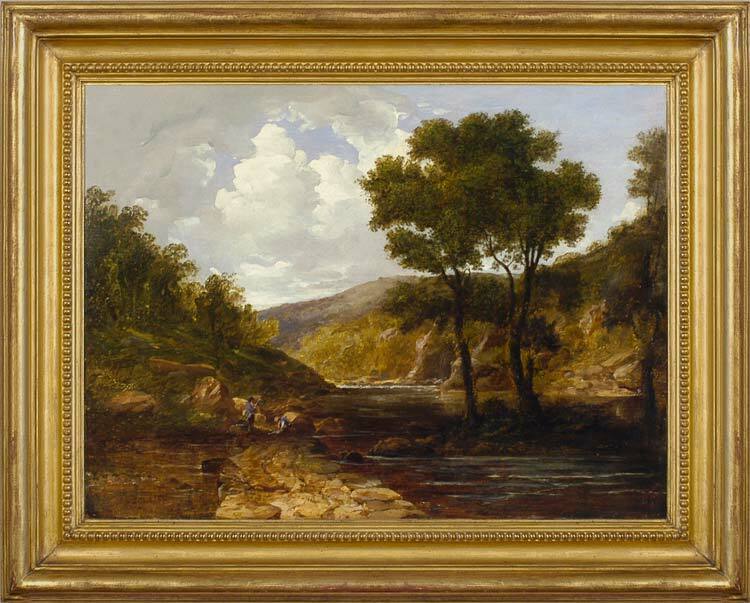 He travelled throughout Britain; this particular painting may represent a Scottish river scene. Frederick Lee (1798-1879) was born in Barnstaple in Devon, son of the architect, Thomas Lee. He trained at the Royal Academy, exhibited there from 1824, was elected associate in 1834 and a full member in 1838. His work was popular with his contemporaries, and he was financially successful. Also popular were his collaborations with Thomas Sidney ‘Cows’ Cooper and Sir Edwin Landseer, both of whom provided the staffage for Lee’s landscape backgrounds (although, according to Kenneth Westwood, an argument over a game of billiards ended the partnership with Landseer). From c.1848-56 Lee lived in Penshurst, Kent, where he concentrated on pure landscape; he then moved back to Devon, and began to produce coastal scenes and seascapes. His success enabled him to buy yachts, in which he sailed to the Mediterranean, the West Indies, South Africa and Australia. In 1864 he visited Garibaldi in Caprera, Italy; a painting of the General’s house was a success at the 1865 RA. He continued to exhibit until 1870 and retired from the RA in 1871. Works in public collections include On the River Lochay, Perthshire (watercolour; London, V & A); Landscape with ruined castle (Calderdale Metropolitan Borough Council); A lane at Cobham, Kent (Maidstone Museum & Art Gallery); Landscape with sheep and Near Oatlands (both Wolverhampton Art Gallery); River scene, 1855 (with Cooper; London, Tate); Scottish landscape, 1830 (with Landseer; Tate); Garibaldi’s residence in Caprera, 1865 (New York, Metropolitan Museum). See notes on FR Lee by Kenneth J Westwood, Thomas Sidney Cooper: His Life and Work, vol. 2, Catalogue of Works Painted with FR Lee (unpublished).